Nine years ago today the Russian Navy lost the nuclear powered submarine K-159 when it foundered in the Barents Sea . The sub had recently been slated for scrapping and was en route to a date with the breakers yard. Commissioned in 1963, the K-159 served in the Soviet Northern Fleet (the same fleet as Tom Clancy’s Red October ) and suffered a reactor accident in 1965. Reports vary on the extent of repairs to the reactor, but the ship returned to active service and was retired in 1989. 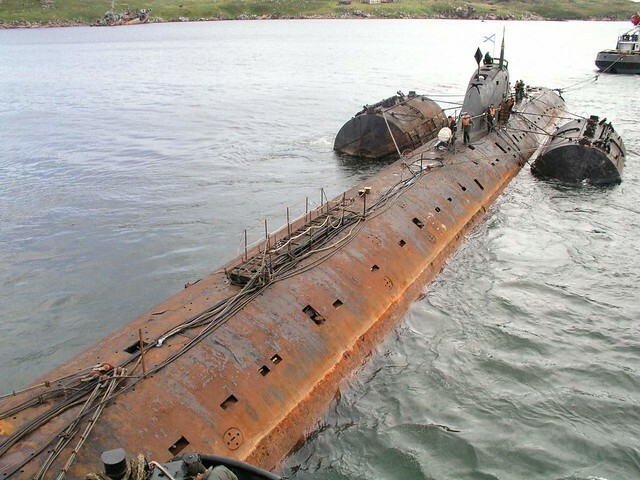 The K-159 lay derelict in a Russian naval yard for fourteen years with minimal maintenance until the decision was made to scrap the ship in 2003. Due to extensive rusting of the ship’s outer hull, pontoons were secured to the K-159 to provide additional flotation. Manned with a 10 man skeleton crew, the sub was taken under tow to a Russian scrapyard. While under tow, a storm ripped away the K-159’s pontoons and the sub began to take on water. Within a few hours the K-159 dipped below the waves of the Barents Sea and came to rest in 781 feet of water. In addition to killing 9 of her crew members, the sub took with it 1,760 pounds of radioactive spent fuel. Plans for salvage have continually been postponed, however the Scottish salvage company Adus located the sub and published sonar scan images of it resting on the sea floor in 2010. The Dutch salvage company Smit & Mammoet (the same firm which salvaged the Russian sub Kursk) submitted a salvage proposal in 2011, but salvage work has yet to begin. While the wreck generated initial concerns of radioactive contamination of the Barents Sea, to date there has been no documented increase in radiation levels in the area.